Crafting in my pj's, at my own pace, whenever I want is one of my FAVORITE things! That's why I love online classes or classes in the mail. There's no pressure, no time constraints and if I don't love something I can make it my own. For those very reasons I offer a monthly class in the mail. There's an option for everyone, no matter where you live, if you are a demonstrator or not. And all the projects are beautiful but easy enough for any level of stamper. So want to hear about this months class? It's focused around the Peaceful Noel bundle from the holiday catalogue. See the bundle here. This class is created for new or experienced stampers. The class kits include all the supplies to create 3 cards and a beautiful wine bottle tag - perfect for the upcoming holiday season. The only supplies you need to create the projects are the following ink pads: mint macaron; tranquil tide and merry merlot. Deadline to register is October 23rd. To register email me(sherry@stampedtreasures.com) with your option. Supplies will be ordered October 24th and then shipped, or be ready for pick by November 5th. If you request option 3 (tutorial only), it will be emailed to you within 48 hours of payment receipt. You don't want to miss out on this class! If you'd like to see more projects created using this bundle, join me live on Facebooktoday (Friday October 12th) at 11am MT. If you miss the live, the replay will be posted on my blog later in the day. Class fee is $60 (+ $14.50 shipping, if needed). Supplies & the tutorial are free in this option! This option can only ship to Canadian addresses. step by step instructions (including measurements). Class fee is $25 (+ $4 shipping, if needed). This option can only ship to Canadian addresses. Option 3: includes the Peaceful Noel tutorial only (no supplies). Cost is $20. This option can be purchased from my tutorial page. Option 4:This option is for the Treasures Stampers team members only. 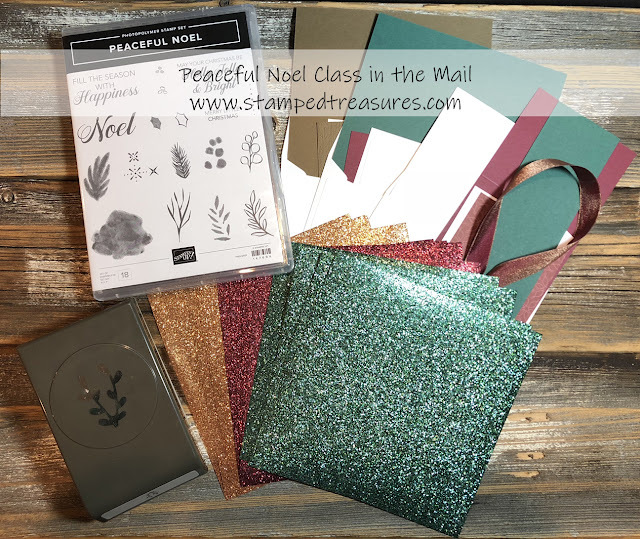 Receive the pre-cut supplies to complete all the projects, including envelopes, 1 of each sheet of the Joyous Noel Glimmer paper and step-by-step instructions. Cost is $15. Not a Treasure Stamper? Ask me how to become one.